CHICAGO, September 10, 2018 – Global corporate travel consultancy Advito created Airfare Predictor, one of the first advanced airfare tracking tools, in partnership with Air Cube, a leading aviation business intelligence and data mining company. The firms worked together to develop technology that Advito’s consultants can use with other tools to provide new savings opportunities to travel managers. The tool measures pricing trends and booking class availability. The ability to compare current and future pricing while negotiating with airlines is backed by real-time, global intelligence. The intelligence helps companies understand prospective fare availability, often for the first time for most corporations, which creates a level playing field for airlines and corporate buyers. The proprietary process and analytics collect airlines’ prices (airfares) 180 days into the future, mimicking a range of real consumer booking behavior. The data goes beyond a single airfare, breaking it down by four components to highlight why fares are changing. Specifics include the fare basis, airline surcharges, taxes and booking class availability. To give an example of how it works, Advito may change a negotiation strategy and yield higher savings when an airline is offering a discount on airfare that is only available 20 percent of the time. Airfare Predictor makes it clear that the proposed discount wouldn’t realize significant savings and Advito would request better terms from the airline. In another scenario, a travel manager working with an Advito consultant may learn that booking a flight segment nine days in advance yields the lowest fare. Airfare Predictor data can better influence a traveler to book a flight at the optimum time for considerable savings. Airfare Predictor supports Advito’s holistic, ongoing approach to travel program performance management and will be integrated with the company’s Dynamic Performance Management™ and Traveler Engagement™ services. “Advito clients who participated in the BETA tests said this is a game changer because until now, nobody knew how to use this information to their benefit,” Benoit said. Advito is breaking boundaries in corporate travel. With a powerful, intelligence-driven framework that dynamically manages supplier spend and traveler behavior, travel programs can continuously run in balance and at peak performance, keeping the needs of all stakeholders met. 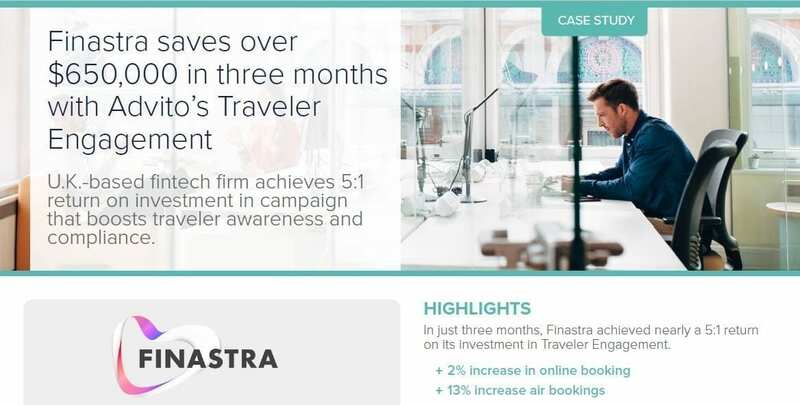 With smart analytics, unique supplier strategies and integrated traveler engagement, we’ll elevate your program to reach new levels of savings and satisfaction. For more information visit www.advito.com or email advice@advito.com. BCD Group is a market leader in the travel industry. The privately-owned company was founded in 1975 by John Fentener van Vlissingen and consists of BCD Travel (global corporate travel management), Travix (online travel: CheapTickets, Vliegwinkel, BudgetAir, Flugladen and Vayama), Park ‘N Fly (off-airport parking), Airtrade Holland (consolidation and fulfillment) and joint venture Parkmobile International (mobile parking applications). BCD Group employs over 14,000 people and operates in 109 countries with total sales of US$26.4 billion, including US$10.4 billion partner sales. For more information, visit www.bcdgroup.com. Air Cube, the market leader in airfare related business intelligence, is a privately-owned company founded in 2011 by Jérôme Perez. Combining outstanding expertise in Business Intelligence & Data Mining together with a keen business understanding of pricing and travel distribution supported by decades of combined experience in the airline and travel sector, Air Cube is a trusted supplier of airlines, online travel agencies and travel management organizations worldwide.